Inventus Power’s decades of experience designing rechargeable power systems across multiple markets and a dedication to safety, quality & innovation aligns with Soteria’s mission of zero lithium-ion battery safety events. Soteria BIG is a consortium of companies representing the ecosystem of developers and users of energy storage technology for a wide range of markets. Soteria’s separator and current collector technology, which helps to prevent an internal cell short circuit from escalating into thermal runaway, is just one example of new safety technology that the consortium would like to promote to the market. 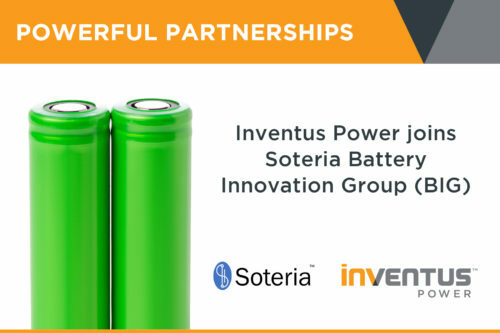 “Inventus brings significant expertise to help our other consortium members integrate the Soteria architecture into battery packs adapted to specific applications and markets. We look forward to working closely together to optimize safety, weight and cost improvements for its customers’ and our consortium members’ benefits,” said Brian Morin, CEO of Soteria BIG. Both Inventus Power and Soteria Battery Innovation Group will exhibit at the International Battery Seminar in Ft. Lauderdale, Florida on March 25th through the 28th. Soteria is also having its second member meeting on March 25th where Mr. Turner will join representatives from NASA, Mercedes-Benz, NIO and Motorola Solutions on an end-user panel discussion of the technology.